The 2013 ShowBoats Design Awards are only a few weeks away, in which best in superyacht design is honoured during a gala evening hosted at the Monaco Opera House. 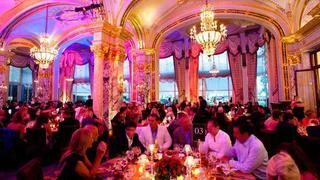 There are limited tickets remaining to the event, which takes place June 21 in Monte-Carlo, Monaco. The ShowBoats Design Awards honour the industry's creative talents, and owners of the 2013 finalists yachts, their celebrated designers and the world's leading shipyards have already confirmed their attendance at the glamorous evening, which combines the awards prize giving and an evening of fine dining and entertaining at the Hotel de Paris. A wholly independent judging panel of yacht owners, senior yacht crew and acclaimed naval architects, designers and stylists from within as well as outside the yachting industry have selected the winners from a list of the year's top superyacht launches. The ShowBoats Design Awards coincide with the 23rd edition of the The Rendezvous in Monaco, which will see many of the finalist yachts in attendance, such as 72.1m VSY yacht Stella Maris and Tansu's 33.9m Only Now. The yachts and their owners will join the full programme of yachting and social activities take place 20-23 June, which presents an ideal opportunity for owners to socialise with like-minded peers.